My husband actually put the first cloth on our daughter. This was a Born Smart–ignore the fit (we were still learning)– but you can see how a one size diaper would never have fit her. A preemie sized Little Joey on the left, a newborn Thirsties, and a one-size Thirsties. Newborn sized diapers are adorable! If you give birth to 9+ pound giants however, you probably don’t need a newborn stash. If you have average to below-average sized children, or even preemies, newborn stashes are absolutely worth it! You may see ‘hacks’ on different sites showing you how to get a one size diaper to fit a newborn, but if you can afford a newborn stash you will have fewer leaks, and your newborn will be much more comfortable in a diaper designed to fit their small frame. Newborn stashes can be identical to the one-size stash you’ve collected. Mine is–newborn-sized AIOs and then one-sized ones as well. If you don’t feel like investing much into your newborn stash because of the short time you will use it, newborn-sized covers and flats or prefolds are your cheapest option, just like with one-sized diapers. A newborn stash of flats, prefolds, and covers. If you have exceptionally small babies, multiples, or preemies– XS prefolds and flats along with preemie covers (Thirsties brand makes an excellent preemie sized cover) are a great fit. If you are looking for a more convenient or caregiver friendly option, Little Joeys are great preemie-sized AIOs, and they come in packs of two–great for twins! It is important to note that most babies start out-peeing newborn diapers before they get too large for them, especially if they are made of microfiber. There are ways to extend the life of your newborn stash though, especially if your child still doesn’t fill out a one-size diaper yet. Some of the better newborn diapers are made of natural fibers. They are absorbent enough to last until your child fits one-size diapers without needing to add much in the way of extra absorbency. An adorable selection of newborn-sized AIOs! Little Joeys: Great for smaller babies and the first few weeks when babies still have their umbilical cord stump–they have a snap down to make space for the cord. They’re made of microfiber though, so they tend to be out peed quickly. You can add a bit of absorbency by laying a baby washcloth in them. Sweetpea bamboo: These have Velcro closures, which can really help to get a good fit the first few weeks when babies tend to be chicken-legged. The bamboo is very absorbent–unless your baby is a very heavy wetter it should last until one-size diapers fit. Nicki’s bamboo: These come in snap and Velcro closures- and they’re also very absorbent. These fit my little girl until she fit into the one-size version of them. Definitely a crowd favorite in this house! Thirsties natural: This is a newer newborn diaper. They also have a microfiber version, but natural fibers will last you longer in terms of absorbency. Born Smarts: These will need to be washed several times before use because they are made of unbleached organic cotton, just like their one-size version. They have a snap-out booster and a nice notch for the umbilical cord stump. These work best on babies with chunky legs–if your baby’s legs are thin, it’s difficult to get a good fit. Imagine bamboo: These were just reworked to make them roomier and softer–a very nice diaper at a low price point. Nicki’s Ultimate: These are more user-friendly in that they don’t have rolled elastics like their bamboo AIO, but they are microfiber and tend to get out-peed quickly. These are pretty easy to add absorbance to though; just place a newborn booster or washcloth under the soaker tongue. Small Planet Wise wetbags. These are perfect for holding 2-3 newborn sized diapers, and when you are done using them with the diapers they are great for organizing your child’s suitcase and diaper bag. Newborn-size boosters are really necessary for adding absorbency to a smaller diaper–regular boosters will be way too big. Baby washcloths, as mentioned earlier are a great way to add a little boost to a newborn-size diaper without adding a lot of bulk. Small Planet Wise wetbags, Geffen newborn super absorbers, and a baby washcloth. 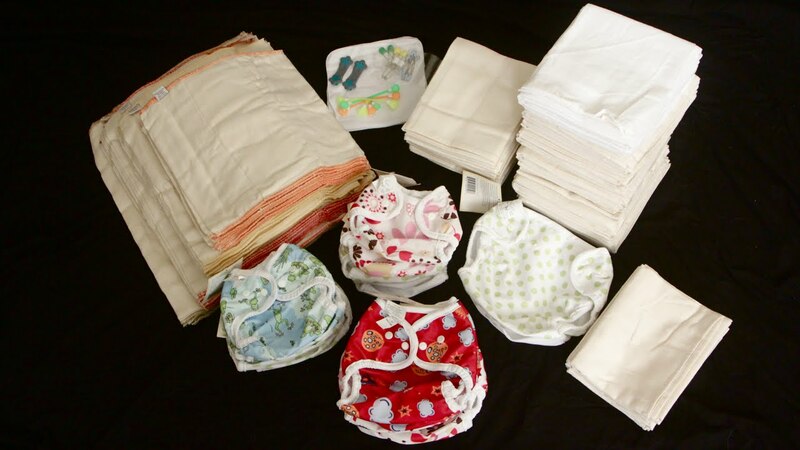 Newborn stashes are a lot of fun, and one of my favorite things about cloth diapering! I hope you’ll tune in tomorrow for our next installment of The 12 Days of Clothmas–prepping and laundering your cloth! Its a very important topic, and one a lot of people have questions about as they first start cloth. See you then!